According to a recent study, 35% of the user community loves to order the groceries online. Usually, it becomes quite tedious to purchase groceries while standing in a long queue. Undeniably, it is becoming really tiring to choose for people nowadays. Hence they are turning to the Grocery Delivery Mobile apps, for getting the products at the doorsteps. Development of an online grocery delivery app on iOS and Android platforms, it indeed requires a lot of thought process. It’s not just about developing the app but also about maintaining the app to ensure it’s delivering a great experience to the end users. A grocery delivery app is nothing short of a Marketplace app since the app will have to show grocery products from various sellers under different product categories. Apart from all the standards e-commerce marketplace app features, the app can have its own specific features to distinguish itself from the other apps. So once you have your features list ready, you can actually decide features which are must for your grocery app in the first version and features which are good to have which can be released over a period of time. 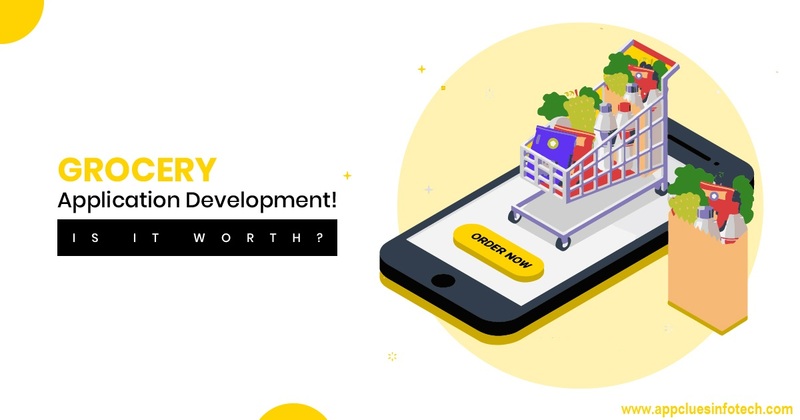 Grocery App Development Company is changing the way people buy grocery online that do all the thinking, processing and management for you. Grocery Apps designed and developed at “AppClues Infotech” are straight forward, innovative, user interactive, advanced and yet easy and quick to use. We will help to build you a beautifully designed mobile app that will be packed with features to help grow your grocery store revenue. The grocery mobile apps such as Instacart, Grofers, and Bigbasket have already made a huge impact on the on-demand grocery market, hence there is no confusion in saying that future of the grocery delivery mobile apps will continue to bloom in the coming years. The important thing to remember in your on-demand grocery mobile app development is that Help and support staff may also in some cases be handed out administrator privileges, in order to fix common grievances to customers, without the direct involvement of administrators. This allows them to proceed with more important tasks such as keeping the system running and managing the data, while the help and support staff cater to requests and complaints from users. It is to be noted that administrator account credentials, thus, must not be shared with unknown or untrusted sources. Data Security is going to be a very crucial aspect of your on-demand grocery app development. There are some mobile apps, which are particularly dedicated to offering grocery products only. Examples include BigBasket, Grofers etc. They enhance the shopping experience of the consumers and offer services such as grocery list, Grocery IQ, and delivery. As the sales of online grocery are moving up, even the supermarkets like Costco, and Publix etc. have started offering the various grocery items through an app. They combine the functionalities of both personalized and e-commerce grocery apps with push notifications and beacon technology when the customer is near to the store. The most popular e-commerce apps such as Amazon, Flipkart etc. offer the widest range of grocery items in various user locations. They also allow the customers to select a suitable delivery time according to their convenience.